Three goals in the first six minutes handed Manchester United victory over Reading in a remarkable FA Cup fifth-round replay. Gabriel Heinze opened the scoring after two minutes when his 25-yard shot squirmed under Adam Federici's body. 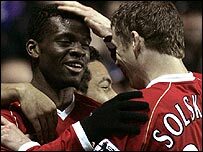 Louis Saha rifled in an angled volley for 2-0, before Ole Gunnar Solksjaer slotted in the third. Reading pulled one back through Dave Kitson's header before Leroy Lita's late strike ensured a thrilling finish. It was nothing less than a sensational start at the Madejski Stadium. As well as the visitors did with the chances that came their way, each goal was a gift courtesy of the generous and, frankly, awful Reading defence. The calamity began with just two minutes of the match played. A break on the right saw O'Shea's pull-back arrive at the feet of full-back Heinze. The Argentine steadied himself and fired in a low shot that squeezed under the body of the flapping Federici - who, ironically, was handed the Man of the Round award after his sterling efforts at Old Trafford. Almost straight after the restart United were 2-0 up when the lively Saha chested down Rio Ferdinand's raking pass and struck his angled volley past the Australian keeper. And Solskjaer rubbed salt in the most open of Reading wounds when he collected Kieran Richardson's pass, sprung the offside trap, and planted an eight-yard shot with the outside of his boot past the demoralised Federici. Royals boss Steve Coppell did eventually realise things were not going right for his team after 15 minutes, changing from having three at the back to a 4-4-2 formation. It steadied the rocky ship and stemmed the United tide. Reading reduced the deficit midway through the half when Ivar Ingimarsson flicked on John Oster's corner to Kitson, who nodded in from two yards. Game on? Not at that point. Oster, who was very lively down the right, was giving the United defence a tough time and keeper Edwin van der Sar had to be alert to a handful of teasing crosses - but the Manchester side were coping well. However, Sir Alex Ferguson's midfield became increasingly sloppy in the second half and Reading took advantage. They gave their supporters some hope six minutes from time when Lita converted Ulises de la Cruz's cross from 12 yards. And with just a few seconds remaining of the match, Brynjar Gunnarsson almost took the tie into extra time when his 20-yarder beat Van der Sar, but rattled off the crossbar. "It was obviously the worst start possible. You talk about starting well and keeping it tight but it wasn't long before we were 3-0 down. "Then you think what can you gain from the game. "It was a great second half and respect for my players. We have proud players who didn't want to be humuliated." "Our side made the best start I've ever seen them make with three goals in the first six minutes. "Reading's first goal gave them a lifeline and then their balls into the box gave my defence a hard time. "After they scored their second I thought it was going to extra time. It was going that way." Reading: Federici, De la Cruz, Gunnarsson, Bikey, Ingimarsson, Shorey, Ki-Hyeon (Little 68), Sidwell, Oster, Kitson, Doyle (Lita 71). Subs Not Used: Hahnemann, Hunt, Sodje. Booked: De la Cruz, Bikey. Goals: Kitson 23, Lita 84. Man Utd: Van der Sar, Silvestre, Brown, Ferdinand, Heinze, Park, O'Shea, Fletcher, Richardson, Saha (Rooney 76), Solskjaer (Ronaldo 89). Subs Not Used: Kuszczak, Smith, Scholes. Goals: Heinze 2, Saha 4, Solskjaer 6.